Place Varna Rat bait station indoors or outdoors, in areas frequented by rodents. When used in warehouses or around perimeter of food processing plants, place a Bait Station every 15 to 20 feet for severe or continuous rat infestations, less for light infestations. Allow rats to eat and get killed. Varna Rat bait stations protect your rodenticides from moisture, dust or other contaminating elements while keeping rat baits out of reach of non target animals. These rodent baiters keep your bait fresh while providing a prime feeding station where Roof Rats, Norway Rats and mice consume your rodenticides. 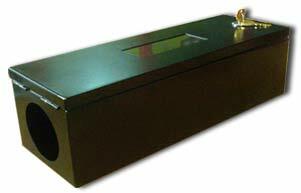 Rat Bait Stations are best suitable for commercial godowns, and outdoors, factories.